In Harry Potter and the Goblet of Fire, Harry is midway through both his training as a wizard and his coming of age. He wants to get away from the malicious Dursleys and go to the Quidditch World Cup with Hermione, Ron, and the Weasleys. He wants to dream about his crush, Cho Chang (and maybe do more than dream). And now that he's gotten the hang of things at Hogwarts-he hopes-he just wants to be a normal fourteen-year-old wizard. But even by his standards, Harry's year is anything but normal. First Dumbledore announces the revival of a grand competition that hasn't taken place for one hundred years: the Triwizard Tournament, where a Hogwarts champion will compete against rivals from two other schools of magic in three highly dangerous tasks. Then someone frames Harry to participate in the tournament-which really means someone wants him dead. Worst of all, Lord Voldemort may finally have gathered the materials necessary for his rejuvenation... and he has a faithful servant at Hogwarts waiting only for a sign. No, nothing is every normal for Harry Potter. And in his case, different can be deadly. 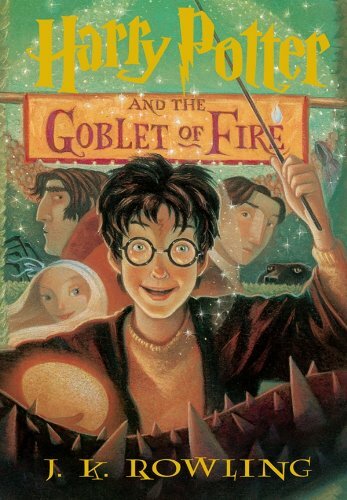 bennettgavrish (Grade: A–) "Goblet of Fire" is another big step in the series, as Rowling expands her universe and introduces loads of new characters and mysteries. It's also the funniest installment so far, thanks to Hermione's activism, Ron's one-liners, and Mr. Weasley's all-around awesomeness. Andy (Grade: A) This book marks the series' transition from a Rauld Dahl-esque children's story into more teen-oriented fiction with a decidedly darker tone. yeahitskonnor (Grade: A+) Everything changes in the Tr-Wizard Tournament! Harry has to grow up, death becomes real, Harry's relationships with family and friends are challenged. Out of books 1-4, 4 is definitely my favorite. It introduces us to the other magical schools, their annual tournament, and we see Voldemort arise in a new way. DorianaGraye (Grade: A+) This is my absolute favorite book in the Harry Potter series. Rowling balances action, plot, adventure, and theme adroitly. It's worth saying that I think this is the best edited volume of the series as well--the editing really falls off after this installment. underdog92 (Grade: A) I loved the Harry Potter series. It was so magnificent and, for the lack of a better word, magical. To think that the series is over, is heartbreaking.